Iaido and kendo are both budō that place a strong emphasis on manners and etiquette – not only to our partners, but also the spaces within which we practice and to opponents who are not even there. This is distilled into the common phrase: “Training begins and ends with etiquette.” However, we also perform plenty of actions throughout training that are all about respect and bring a serious manner to our training. It can be easy to forget the significant of these actions when focussing on what we consider the main part of our training, but these small actions demonstrate an awareness of the greater context within which our training sits. A great example of these expressions of respect can be found in how we handle swords, in their various forms, in both iaido and kendo. Even the way we hold and place our swords are expressions of respect towards our partners and the practice we are undertaking. 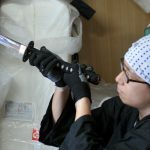 This article is going to look at some established conventions for handling swords in iaido and kendo and then discuss how these relate to etiquette within keiko and how they inform our attitude in training. It is often said is that the way we hold our equipment is to always be ready to act and strike at a moment’s notice. This often means a sword is held in the left-hand, so it can be drawn quickly to respond to a perceived threat. 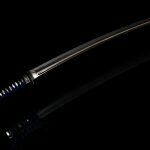 In certain contexts, this is true – however it is easy to forget the many circumstances within keiko where we do not treat our swords in this manner. For example, it is inappropriate to enter a dojo with your sword ready to be drawn or to have it placed on your left-hand side when you are preparing for kata. Rather your sword should be on your right-hand side with the edge presented in the most non-threatening manner. 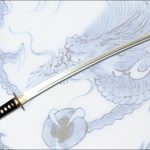 When kneeling in seiza; your sword will be placed on your right, blade side inwards towards the leg – this makes it very difficult to draw conventionally. Therefore, this is an expression of respect – a demonstration that you are not here to threaten, instead you are sincerely waiting to begin practice. When walking with your sword, perhaps when entering the dojo or taking your place for a demonstration, again your sword should be in your left hand. Some go so far as to have the blades edge facing behind you. This is common practice in iaido, but not so strictly enforced in kendo. However, in kendo you can still see the principles applied when we practice the Nihon Kendo Kata: the sword starts in our right hand and enters our left. This action is derived from placing your katana into your obi so it may be drawn correctly (or conventionally, with the right hand). Again we are moving from a non-threatening respectful posture into one ready to practice. The final act I want to draw attention to is the act of passing a sword to someone else. This is done carefully with the sword held in both hands, your palms facing upwards – supporting the sword at either end of the saya with the tsuka on your right-hand side and the blade’s edge facing you. As with all the other positions the common theme here is difficulty in drawing the sword. The person you are passing it to then uses their right hand to grasp it palm down in the middle. This whole process is an expression of respect and trust. By handing a sword over in this manner you are trusting the receiver not to draw it against you – it is far easier for them to grasp the sword in a manner from which they can draw it than it is for you. Conversely the receiver demonstrates respect by grasping it with their right hand which will take it to a position which is likewise non-threatening (from a conventional stand-point). I believe one of the reasons we do this is to practice the concept that we are handling a sword. Note that throughout this article the words iaitō and bokutō are not used. This is because that during practice they are analogous to the katana and the way we handle them reflects this. This etiquette mostly likely derives from the koryū context from which iaido and kendo both come from. 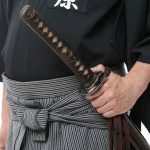 Iaido is more explicitly associated with koryū schools than kendo, but kendo’s methodology and practice is no less influenced by traditional Japanese kenjutsu. If you look at demonstrations of Ono-ha Ittō-ryū and Tenshin Shōden Katori Shintō-ryū, you can spot many of these actions (granted, alongside several differences). These expressions of etiquette are by no means uniform and do vary from dojo to dojo, this is likely down to the fact that there are varying levels of knowledge and interpretation between teachers and dojo within a martial art. Another thing to consider is the standardisation of a martial art, like Kendo, to meet the needs of many junior practitioners. This can be seen in the way shinai are handled, for example. People can and do treat the shinai just like a real sword and we are encouraged to think about the shinai in those terms during practice. However, we do not handle them anywhere near as strictly as we do bokutō. What all these acts result in is a developed awareness when it comes to your training. You are encouraged to constantly consider your position and context and express respect through all of your actions – not just a few scripted bows. Furthermore, treating your tools as what they are meant to represent elevates your training. Next time you are training, consider how you handle your sword. Are you giving it the attention it deserves? How does the way you treat it inform your keiko and techniques? If you are chasing that extra bit or verisimilitude in your kata or keiko try starting with how you handle your sword. How do I take care of my Iaito?